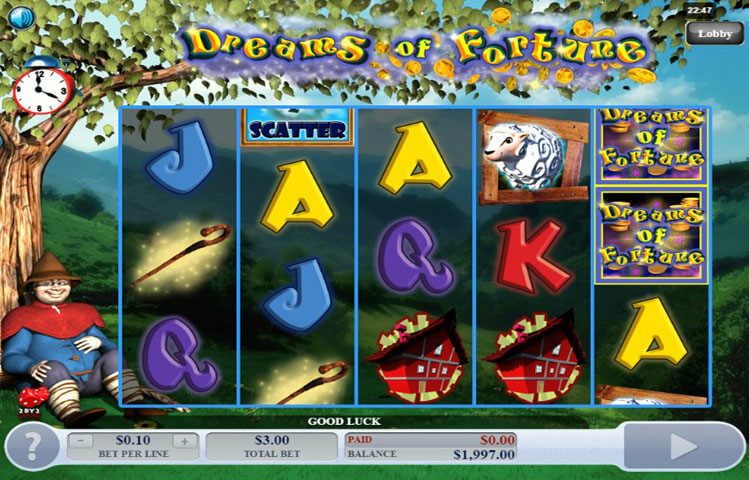 Dreams of Fortune is one of the latest games by 2by2 Gaming. The slot takes players on a great gaming experience that has 5 reels with 30 wager lines. The game is all about fortunes and prizes. This is why the title of the game is “Dreams of Fortune”. Therefore, players will be able to enjoy quite a lucrative experience, while enjoying an immersive ride whenever they get to spin the reels of this game. Dreams of Fortune has a pretty simple game play, which is not a surprise, since the game is from the portfolio of 2by2 Gaming. Players will easily place their bets underneath the reels as they go through the slot’s betting option. The betting option is the bet per line, as all 30 lines are fixed and are always active. The bet per line varies between 0.01 and 1. This means that the betting range is between 0.30 and 30 credits for each spin. The game takes players into a fairy tale land that is full of fortunes, prizes and payouts. Players will claim these fortunes through the 30 lines of the game, and its special features and icons. The players will join a man in an adventure in that fairy tale land as he looks for his own share of the fortunes that this world has to offer. Since the game is developed by the team at 2by2 Gaming, players can expect state of the art visuals that immerse players into the theme of the game. The game’s reels themselves are located in that fairy tale world and players will see the man that they will join in that adventure on the left side of the reels. As for the symbols, they include a sash of golden coins, a house, sheep, golden fortunes, the man that the players will join as well as card icons. These card icons represent the low paying symbols of the game. The symbols will turn into animations whenever they are a part of a winning combo. This adds to the authenticity and the engaging experience of the game. The game has a couple of special icons. The first one is the special wild logo. This wild logo is going to substitute for all other icons across the game’s reels and 30 lines. It will replace the symbol that will result in the best payout, depending on the rest of the icons on the lines. That is not all, as it can also give generous line prizes when it is matched. The only icon that it will not replace is the scatter icon. This scatter icon is the Z Z Cloud icon. This scatter icon is going to give out scattered rewards, plus triggering the free spins round.